Thanks to Steve Jeffs for writing this article. 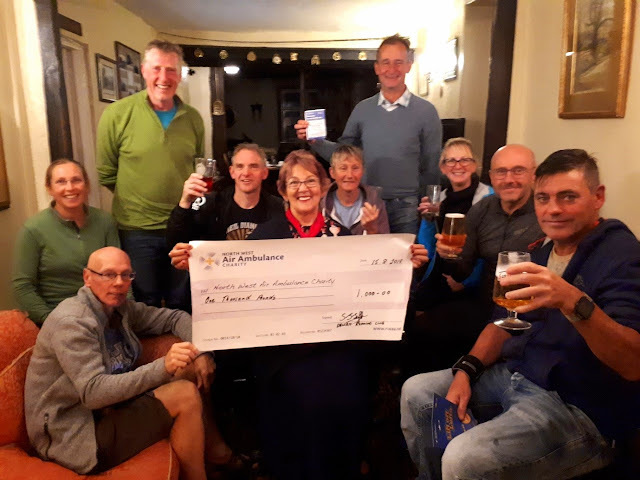 Dallam is a small and sociable running club with around 80 senior (over 18) and 30 junior members that operates in the South Lakeland and North Lancashire area. We meet every Wednesday for a social club run and to plan for the more adventurous week end races and events. Our Wednesday runs throughout the year are mainly on the trails and lower fells (with the option of a faster road run during the winter months). The club is extremely active and we have members involved in fell races all over Britain, many completions of challenge events such as Bob Graham Rounds, Lakeland 50/100, Old Counties tops race, 3peaks etc. One of the clubs more unusual roles is to ensure we “give back” to the local community as much as possible. 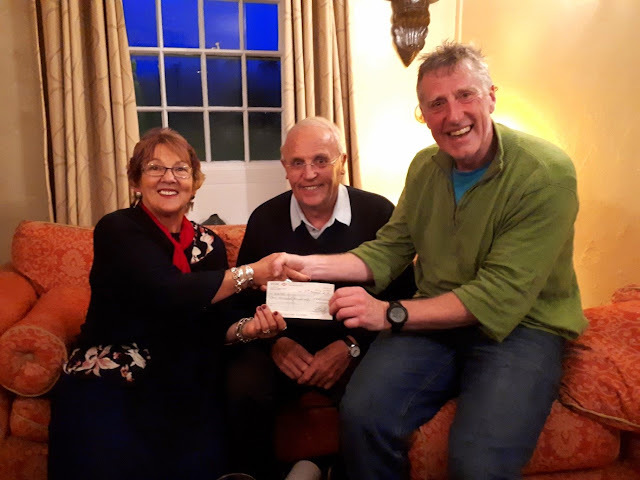 To this end most of the income from our local races (Arnside Knott and 20 Barriers) and other money raising activities is given as charitable donations to local good causes. We recently gave a donation of £1000 each to the North West Air Ambulance and the Fix the Fells organisations. On the 15th August after a particularly wet but enjoyable run around the Barbon Fells a presentation was made to NWAA and club members were able to hear first-hand about the remarkable work that this essential charity does year after year. Our £1000 donation is not nearly enough to keep the helicopters flying, but as they said…….” every little counts”. A couple of weeks later it was…. “same old, same old” when Dallam runners met for a very relaxed run around The Helm. After a great 6 mile run we retired to the Station Inn, Oxenholme to present a cheque to Joanne from Fix the Fells. 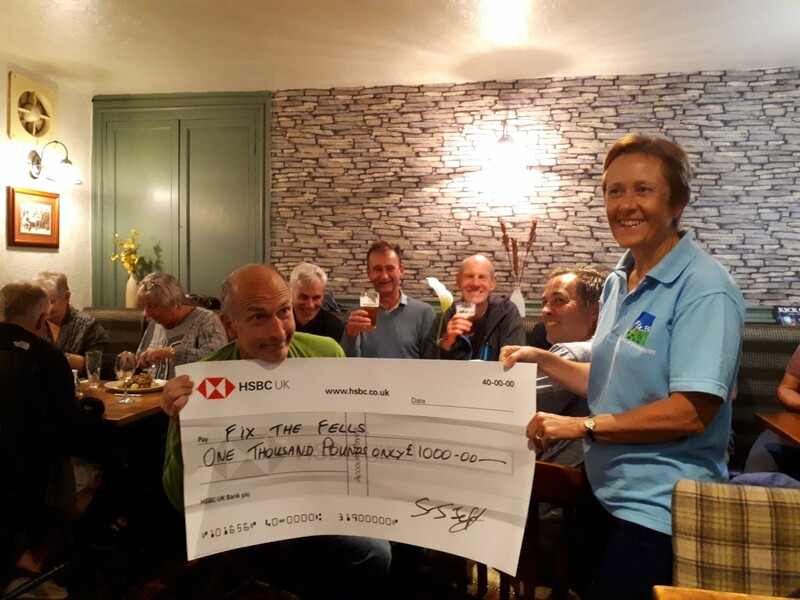 As most members regularly run in our beautiful lake district fells this donation is seen as akin to - mending the sports hall roof! This year 2018-19 we are donating to Manna House Kendal along with NWAA again. If anyone is looking to start or indeed progress their running, then Dallam Running Club is a very friendly and knowledgeable local club. We have regular planned “easy runs” every Wednesday for seniors and Junior training on a Monday evening based at Tristrams in Heversham (with a senior run out too).We compete in road, trail and fell races and enter teams into the Fell and Hill relay championships, Hodgson Brothers relay, High Peak Marathon, Lakeland 50/100 etc.